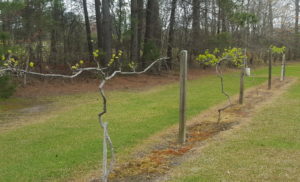 Register Now for the upcoming Beaufort County Extension Muscadine Pruning Workshop! The workshop will begin promptly at 9 a.m. at the N.C. Cooperative Extension, Beaufort County Center located at 155 Airport Road in Washington, NC on Tuesday, February 26, 2019. There will be a classroom portion that will last around an hour. Participants will learn about disease and pest information in the classroom session as well as basic pruning methodology. 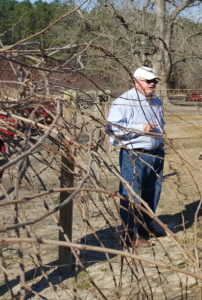 We will then load up into our vans to go to a local homeowner’s vine for hands-on pruning. This vine has not been pruned in a couple of years and so the class will see how to bring a vine back into production. Participants will learn how to prune vines for optimum production in the home landscape, best methods of training vines, tools used for pruning, and how and when to replace cordons. This will be a hands-on class that will be rain or shine so please dress accordingly. The vans will arrive back at the Beaufort County Center no later than 12:30 p.m. on Tuesday afternoon. Participants are asked to travel in vans to facilitate parking at the homeowner’s residence so space will be limited. This is a free workshop but participants must register for this reason. You can register by following this link to a registration form or calling the N.C. Cooperative Extension, Beaufort County Center and speaking with Sam or Ashley (252)946-0111.